The Popcorn Factory® Fans! Enter for a chance to win popcorn and a movie night this summer! Teenager Reagan Wills has one dream, to play soccer like her hero, Alex Morgan. When Reagan fails to make her middle school soccer club, she fears her dream is over. But after a freak accident, her life-size poster of Alex Morgan suddenly comes to life and everything changes! We’re giving away 10 MOVIE NIGHTS! You don’t want to miss out on this unique opportunity for a chance to win “Alex & Me” on Digital HD, and ALSO a Tin of Popcorn for all the popcorn lovers out there! Winners will get 2 gallons of 3 delectable flavors: Butter, Cheese and Caramel! Click here to enter and fill out the form. Happy Caramel Popcorn Day!! We’re always celebrating rich caramel + delicious popcorn — especially today. It’s National Caramel Popcorn Day! Take the poll while you’re munching on this sweet & salty snack. The Popcorn Factory ® Fans! Enter for a chance to win popcorn and a movie! A new Blade Runner unearths a secret that could plunge what’s left of society into chaos and leads him on a quest to find a former LAPD blade runner who’s been missing for 30 years. We’re giving away 20 MOVIE NIGHTS! You don’t want to miss out on this unique opportunity for a chance to win “Blade Runner 2049” on Digital HD, but ALSO a tin of Popcorn for all the popcorn Lovers out there! Winners will get 2 Gallons of 4 delectable flavors: Butter, Cheese, Caramel and White Cheddar! The Popcorn Factory ® Fans! Enter for a chance to win popcorn and a movie! The Popcorn Factory ® Fans! Enter for a chance to win popcorn and a movie! We’re giving away 20 MOVIE NIGHTS! We’re giving away Digital HD copies of Storks + a 2-gallon Popcorn Lovers Tin! Storks promises to be full of fun and an overall family-friendly cinematic experience. Storks have moved on from delivering babies to packages. But when an order for a baby appears, the best delivery stork must scramble to fix the error by delivering the baby. You don’t want to miss out on this unique opportunity for a chance to win Storks on Digital HD, but ALSO our NEW Popcorn Lovers Tin design with gallons filled with pure popcorn happiness. Winners will get 2 Gallons with 4 delectable flavors: Butter, Cheese, Caramel and White Cheddar. A delectable mix! Enter for a chance to win popcorn and a movie! The Popcorn Factory ® Fans! Enter for a chance to win popcorn and a movie! We’re giving away 20 MOVIE NIGHTS! We’re giving away Digital HD copies of Suicide Squad + a 2-gallon Popcorn Lovers Tin! Suicide Squad promises to be full of action, fun and an overall thrilling cinematic experience. A secret government agency recruits imprisoned supervillains to execute high-risk, black-ops missions in exchange for clemency. 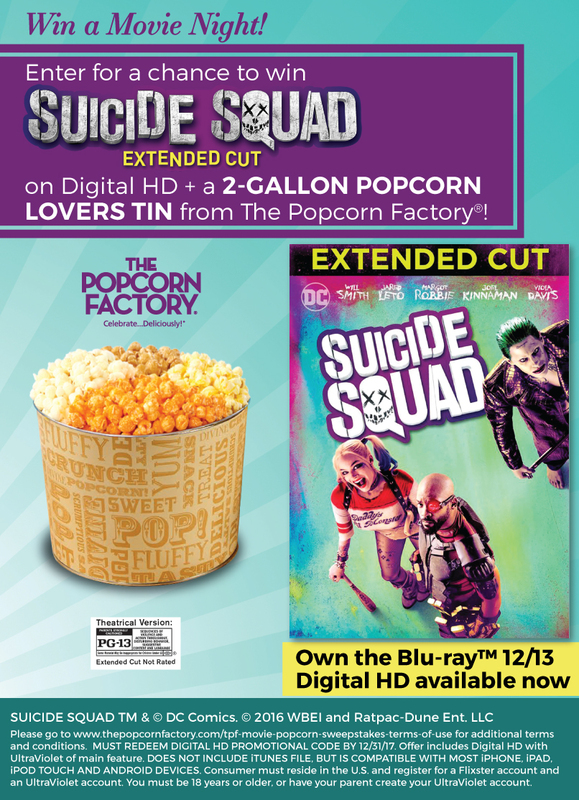 You don’t want to miss out on this unique opportunity for a chance to win Suicide Squad on Digital HD, but ALSO our NEW Popcorn Lovers Tin design with gallons filled with pure popcorn happiness. Winners will get 2 Gallons with 4 delectable flavors: Butter, Cheese, Caramel and White Cheddar. A delectable mix! SUICIDE SQUAD and all related characters and elements are trademarks of and © DC Comics. © 2016 Warner Bros. Entertainment Inc. and Ratpac-Dune Entertainment LLC. The Popcorn Factory Fans! Enter for a chance to win popcorn and a movie! We’ve teamed up with Warner Bros. Home Entertainment to enhance your movie watching experience. We’re giving away Digital HD copies of The Legend of Tarzan + a 2-gallon Popcorn Lovers Tin! Tarzan promises to be full of action, romance and an overall fun cinematic experience. Tarzan, having acclimated to life in London, is called back to his former home in the jungle to investigate the activities at a mining encampment. You don’t want to miss out on this fun opportunity to not only win a Digital HD copy, but you will ALSO win our NEW Popcorn Lovers Tin design with gallons filled with pure popcorn happiness. You will get 2 Gallons with 4 delectable flavors: Butter, Cheese, Caramel and White Cheddar. A delectable mix! Own the Blu-ray™ 10/11. Digital HD Available Now!